If you’re new to our “way of financial thinking” you need to see this video. If you’re a SMARTEST Wealth Veteran… then this will help provide you with a refresher of why you’re doing what you’re doing. 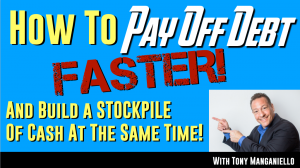 How to pay off debt faster – build a STOCKPILE OF CASH – and SAVE THOUSANDS OF DOLLARS in interest payments is actually pretty easy. These 3 Cash-Flow Secrets will show you how. When it comes to paying your debt off, your creditors would rather you didn’t. This is because they make a ton of money on interest payments. But, if you want regain control of your financial future, you simply must have a plan to pay off debt. Paying off debt is the best way to take relieve stress, and improve your personal finances. Just watch the video and see for yourself..